Shopify is a blown eCommerce brand. The company is currently headquartered in Ontario, Canada. The website builder was launched in 2004 and has become one of the most successful startup projects in the niche since that time. According to recent reviews, the site builder is used by over 200000 clients nowadays. That’s an impressive statistics, indeed! The official website of the service looks trendy and appealing. The site builder is primarily used to create online stores. Let’s have a look at its basic features now to get the idea of whether the resource may be useful to an ordinary user or not. The choice of design is somewhat unusual for a SaaS platform. To some extent, it resembles that typical for CMS. To start with, you need to set up the online store at the home page of the website (Add Online Store) by choosing one of the plans. To customize the design, just choose settings in the «Online Store»/«Themes» section. Free and paid templates are available in the Shopify store. You can sort them out by choosing “Free” option. As a result, you will be offered 26 free templates, the majority of which look quite interesting. They are trendy, if not even bold sometimes. Large sliders, impressive photos, extensive use of white space, stylish menus and logos. There are no complex effects here, but the templates still look quality and encouraging. The cost of paid templates ranges between $100 and $180. Their quality is somewhat better as compared to that of free ones. This is manifested in the versatility of elements used in the process of template creation. There are also many unique templates here, but the difference in quality with Free ones contradicts with the cost. 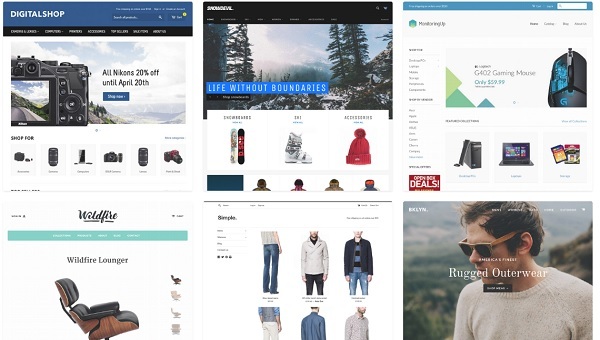 All the templates are responsive, while their customization options are quite powerful in Shopify and have individual differences depending upon the template chosen. You can set up the color scheme, fonts, header, footer, sidebar, shopping cart, social bar, showcase design and other elements. If there is anything that puzzles you here, you can find out more info about each template. Template code editing is a real benefit for experienced web designers. If necessary, you can download the source code of a template or edit it online. Shopify dashboard is powerful and resembles CMS like that in Prestashop or Opencart. It abounds in versatile settings and is quite complicated, although, it is also user-friendly. An opportunity to export/import goods through CSV-files should also be mentioned here. You can download a sample that will help you create and upload a file of this type. Lots of instructions and tips are scattered around the dashboard, so, you can study them if needed. To sum it up, Shopify functionality is on the top level. Right after the registration, you will get a domain that looks like “shop.myshopify.com” that can be further changed. You can purchase another domain in the «Online Store»/«Domain» section of the dashboard. The .com domain will cost you $13. You can also attach the domain from another register, which is also simple. Just login into the account at the website of the chosen register and enter the provided Shopify IP-address in the DNS settings. Basic provides unlimited traffic and amount of products, 1GB of disk space, 2% commission rate, product discounts, 24/7 tech support. Standard plan, called ‘Shopify’ ensures 5GB of disk space, 1% commission rate, gift cards and extended statistics. Advanced guarantees unlimited disk space, 0.5% commission rate, report builder, delivery cost calculator etc. Apart from custom plans, the system also allows selling an unlimited amount of products through social networks like Facebook and Twitter. 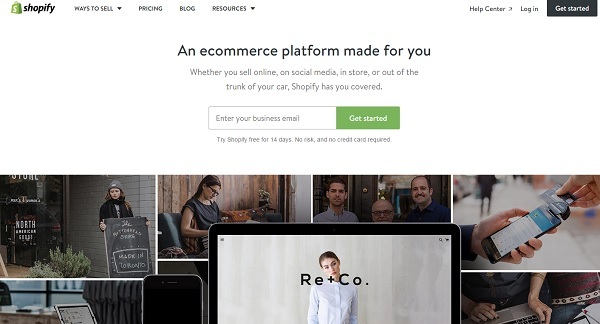 Shopify is an appealing, easy to use, convenient and functional web building tool. However, it is not worth the investment. It’s quite easy to find decent and reasonably priced alternative to the system today.